Bound Revolved Half Moon Pose is generally known as Baddha Parivrtta Ardha Chandrasana. The Word Baddha parivrtta Ardha Chandrasana is originated from Sanskrit Word. In, which Baddha – Locked, bound, Parivrtta – Revolved, twist, Ardha – Half, Chandra – Moon and Asana represents seat, posture or pose. Bound Revolved Half Moon Pose helps to stimulate the solar Plexus, Manipura Chakra; this chakra is connected with personal power as well as self – esteem also. Before performing Bound Revolved Half Moon Pose, please practice Preparatory poses very well. Then, perform this pose; preparatory poses will help you a lot. 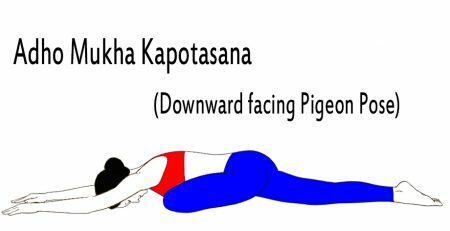 The first step, take the position of Downward facing dog (Adho Mukha Svanasana). Now, breathe in with lifting your leg up, toes pointing towards the roof (during this you have to keep your knees erect). Breathe out along with enter into the Ashwa Sanchalanasana (Equestrian Pose). 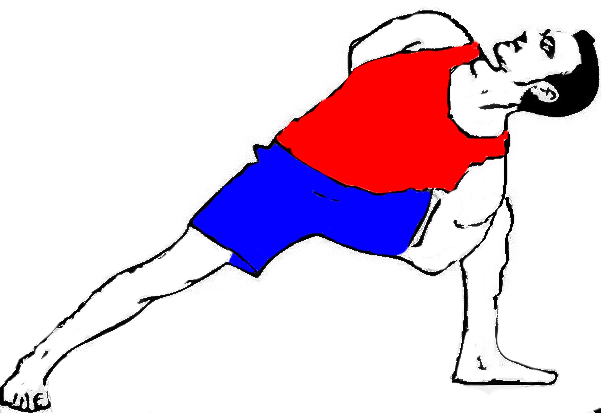 You have to inhale and enter into the Warrior pose type I (Virabhadrasana I). Breathe out and bend your midsection (torso) to the right side of your body. After that, you’ve to keep your left elbow on your right knee with raising chest towards the ceiling. Next, keep your left palm outside from your right foot along with lifting your right arm with fingers pointing towards the roof/ceiling. Now, take your left shoulder to the inner thigh of your right leg. Fold your left arm around your right thigh. Make a circle from your right arm around your back and try to get (reach) your left hand (You can use yoga strap or band if you’re not comfortable to fold your hands). After doing above step, keep shoulders wide but not to collapse your body towards forward. Set your eyes (gaze) onto the roof and hang on for three to six deep breaths. Breathe out and place your left leg just close to the right leg. Breathe in along with gently elevate your left leg and keep it parallel to the floor. Once again remain in this posture for three to six deep breaths. For releasing the pose, free your hands and enter into the Downward Facing Dog Pose (Adho Mukha Svanasana). Follow the same steps on to your alternate side for the same duration. 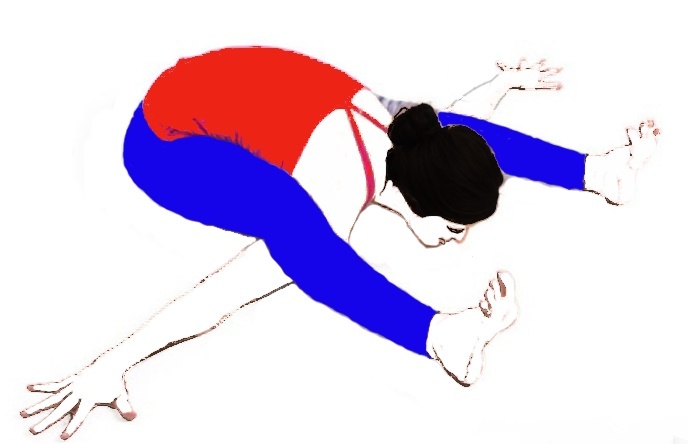 Bound Revolved Half Moon Pose strengthens & stretches your leg muscles, hips, wrists, shoulders, arms, and groins. It improves your concentration level, balance and relaxes your body and mind also. Baddha Parivrtta Ardha Chandrasana gives a good massage to your abdominal organs along with improves your core strength. Bound Revolved Half Moon Pose Makes your spine strong and flexible. Strictly avoid Bound Revolved Half Moon Pose in a knee, hip, back or in CTS (Carpal Tunnel Syndrome) and Pregnant women should not attempt this posture. Remember one thing; always perform all the Asana as well as Pranayama in a correct way under the guidance of an expert person. Keep in your mind that, don’t think about benefits immediately because benefits need more time & Practice so, just complete your season. If you practice Yoga regularly with your hard efforts then, surely you’ll get all the benefits in free of cost. You cannot change your past nor control or predict your future. Just focus on the present day also try to boost and develop your self – confidence. Love yourself and accept yourself the way you are, along with You are very precious to someone, so don’t spoil your life and don’t waste your time.